I have been asked if American Museums were represented among the visitors to the Biennale. I had only run into a few American museum people myself but exhibitors in different fields told me that a number were present. Among the museums represented were The Metropolitan Museum, The Art Institute of Chicago, The National Gallery in Washington and the Speed Museum in Louisville. The Louisville curator brought a group of patrons as well. Of course, many French and even some German museums curators and directors came. Regarding the younger contingent of exhibitors, my favorite gallery was definitely Jason Jacques. 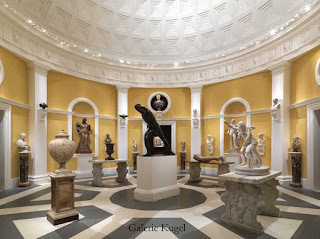 It is a New York gallery and they do not deal in my field but their specialty has been of interest since my wife was curator of 20th century decorative arts at the Metropolitan Museum many years ago. I met two of the principals Jason Jacques himself and Yoni Ben-Yosef. They were showing a large selection of late 19th century French art pottery with a choice selection of European furniture from the late 19th and early 20th centuries. In fact, as a display case for some of the ceramics they used a large cabinet with the most wonderful mounts by the German artist Richard Riemerschmid (Munich 1868-1957). That was something I would have been happy to take home! With the Biennale bringing so many French and foreign visitors to town, some dealers who do not participate use the opportunity to stage their own events, so there was much else to see. A La Vieille Russie, the renowned New York gallery specializing in jewelry and Russian works of art, most especially Fabergé, have an exhibition at the Didier Aaron Gallery while the latter were exhibiting at the Biennale. Originally from Kiev the family firm came to Paris in 1920 and stayed until 1961. Complementing the works of art were photos and texts that lined the walls. They traced the history of the gallery and provided a prime illustration of the interesting ways in which the art world has evolved. At Galerie Aveline on the Place Beauveau, Galerie Neuse from Bremen, Germany did a wonderful installation of their early German silver, objects and paintings. What particularly caught my eye were a few 16th century German pistols covered with engraved ivory inlays,-- another keeper! All this was wonderfully intermingled with great French 18th century furniture from Aveline’s proprietor, Jean-Marie Rossi. But the prize for the most spectacular installation and exhibition had to go to the Galerie Kugel. The Kugel brothers transformed the courtyard of their hôtel particulier (well defined by Wikipedia as an urban ‘private house’ of a grand sort’) using a steel structure to turn it into a mini Panthéon. showcases and niches throughout displayed classical antiquities and 16th century Renaissance interpretations of the classical era. There were many other exhibitions and events but as in any city with so much great culture one can never see it all. Whenever you come home again some one is bound to say: did you see thus and so? You may have missed that particular attraction, but remember, you enjoyed what you did see. By the time you read this one or the other be over but the Kugels’ extravaganza will be open until December 18.